Go one better than a breakfast burrito with this fast, breakfast quiche that is easily transportable. Double the recipe and cook in separate dish for a time-free breakfast the next day. in other words, a breakfast option that is a step in the right direction, but leaves plenty of room for improvement. Step 1: Saute Vegetables In 1-2 tsp. butter or olive oil, saute 1/2 to 3/4 cup red peppers diced to 1/2.” Once they are lightly browned, add a couple good sized handfuls of fresh chopped spinach and cook just until it begins to wilt, stirring frequently. 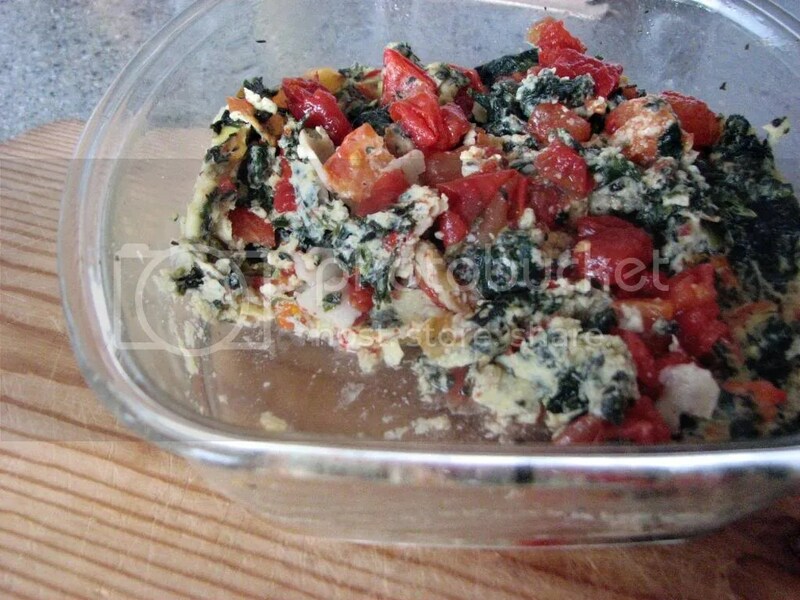 (Timesaver: use about 1 cup frozen chopped spinach and cook until completely thawed.) For flavor stir in 1-2 Tbsp. of your favorite pesto or 2 tsp. dried leaf basil, 1 tsp. Italian Herbs and a pinch of chili flakes. Step 2: Prepare “Crust” Lightly butter a small casserole dish. Tear a whole grain tortilla into 5-6 pieces and lay enough pieces over bottom of dish to cover. Top with cooked vegetables and season with salt and pepper, to taste. Step 3: Add Cheese If desired, sprinkle vegetables with a high-impact (i.e., a-little-goes-a-long-way) cheese like Parmesan or a goat chevre. Step 4: Make Egg Mixture In a small mixing bowl, beat together 2 eggs and 3/4 cup milk or soy milk. Pour gently over the vegetables. Step 5: Microwave Cover and cook in 2-minute intervals at 50% power, stirring gently between intervals to bring uncooked interior parts to outside of dish. Cook until entire quiche is done to taste. Step 6: Top with Tomatoes Also optional, top with high quality chopped canned tomatoes for color and flavor, especially if not using cheese. Microwave 30 more seconds to warm tomatoes. Enjoy a 100% healthful breakfast.